Hello! For those of you just joining us, yes, this is actually the thirty-seventh edition of the Grab Bag of miscellaneous miner tears. It's not just a random number I put at the end of the post title. Look it up. It's true, I have a plan for all the highsec miners. It may not be a plan that everyone is happy with, but it's definitely a plan. Speaking of which, all highsec is buzzing about the tragic fate that befell Carbuilder Hemah. When a hero appears in a MinerBumping post, it's a triumph. When a villain appears in a MinerBumping post, they've usually hit rock bottom. How can you tell the difference between a true Agent of the New Order, and an impostor? It's easy: You'll know them by their actions. If they stand up for the Code, they're the real deal. Another success story! 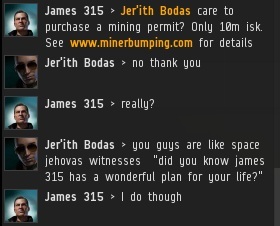 It's always worth your time to send a follow-up EVEmail to the miners that you gank. Some carebears say that I'm a bully, while others suggest that I'm the victim of bullying. 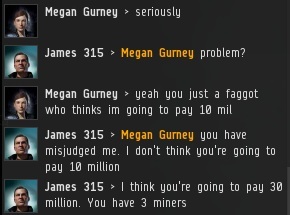 Or maybe highsec miners just like saying the word "bully". 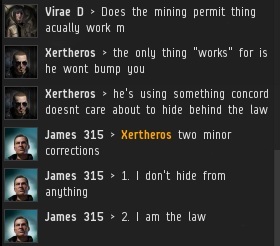 Every so often, our Agents come across a miner who is too confused to be understood. In these cases, it's usually best to bump or gank them. Like hitting an old TV set on its side, the picture may clear up. Peer pressure is real. If anyone in your corp is making you feel uncomfortable about your commitment to the Code, it's time to change corps. After awoxing them, that is. Agents of the New Order are your friends. They're there to help you. But they're also the authority. Please remember to treat them with respect at all times. 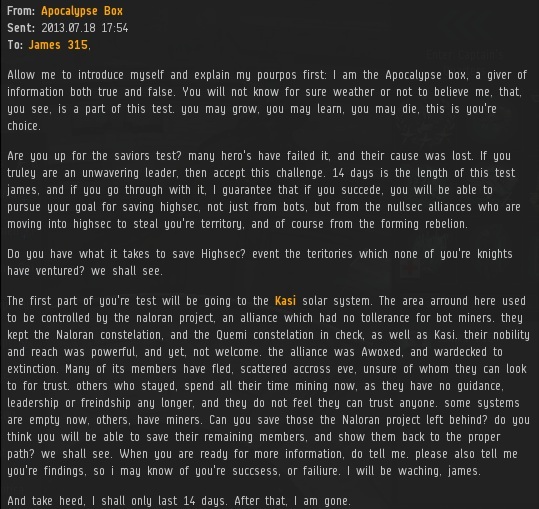 Spoiler alert, I never responded to Apocalypse Box's request. It sounded too much like mission-running. I don't carry out missions assigned by NPCs; I carry out missions assigned by my conscience. Thousands of Code-compliant miners are thrilled by the results they've gotten after acquiring mining permits. If everyone who was happy and successful owned a permit, wouldn't you buy one? This was Keathon Pares's response to Agent Galaxy Pig's helpful post-gank EVEmail. I ask you, how does someone write that and think, "Yeah, this message is ready for the 'send' button"? For at least the last year, there has been an exodus of PvE'ers moving from nullsec back into highsec. They're often in a bad mood for some reason, so I always try to show them some love. 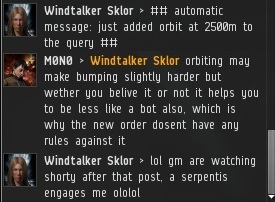 Former nullsec'ers may snap at you, but they'll learn. There's only one authority in highsec, and it ain't on the sov map. 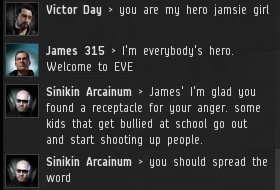 James you're a real rockstar, your posts on the EVE forum about miners are pure genius and this is even better. Just because you're paranoid doesn't mean they aren't out to get you. But in this case, you're just paranoid. No one's trying to knock Carbuilder down, let alone half the game. He sent an EVEmail, people are reading the EVEmail. If he doesn't want people to read EVEmails written by him, he should stop sending them to the New Order. My psychologist fee will be 6 billion ISK, payable to James 315, as a donation which shall be in the name of "Space Psychologist". Also, giving all your assets to a doubler and losing them isn't harassment. It's called "getting scammed because you're a blithering retard." Carbuilder either needs to be true to his word and never log in again, or learn how to deal with challenges in the game. It's very likely that Anon 2:42 is Carbuilder himself. Also the message he wrote is very funny, at the start it was all like "he keeps going forward, he is tough, if you keep messing with him..." so I expected something like "he will fight back to get his revenge"... 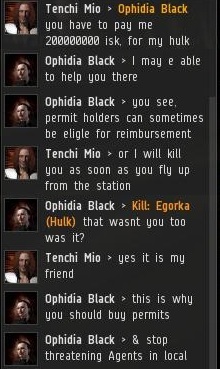 Instead it was the usual pointless "it will be harrassment and you will be reported to CCP mommy", despite the fact that nothing here is against CCP's rules. No, scamming somebody out of everything they own is trying to make easy money off of greedy retards. If I were Erotica, I'd hope Carbuilder keeps going so she can have an easy mark to milk on a different alt every now and then. 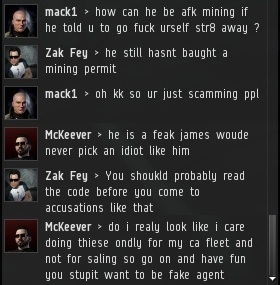 only pansies who would quit after getting scammed think scammers are out to "knock them out of the game"
All I got from that Apocalypse Box post was the mental image of an Apoc Navy Issue asking me if I was a bad enough dude to save HiSec. Hi there James.. I mean Anonymous. 37, a prime number that people mysteriously choose when attempting to generate a random number. An unexplained commonality, when asked to spit out a two digit number, people say 37 far more often than they rightfully, statistically should, far more often than other numbers. I believe 53 is like this as well, also a prime. Now that I've brought this to your attention, you'll notice these two numbers everywhere, on TV, movies, anywhere you know a writer had to pluck a number from their brain. I'm going to retire to my room of mad wall-scribblings. James 315 . 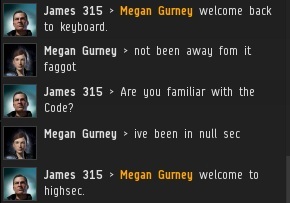 Megan Gurney welcome to highsec"
James sure as hell isn't my hero. The only thing I credit him with is being creative enough to come up with these shenanigans. Sadly, he's of low enough moral fiber to implement it as well. For shame. It's like taking candy from a baby. It might be easy, but you shouldn't be proud of it. 3: Anyone whose blog you post comments on more than 4 times a week. You'll find that technically, under definitions 2,4, and definitely 3, he is your hero, like it or not. I love EVE because it's the only MMORPG that allows players to rightly punish the rude, annoying and offending players like the miners depicted here.